I love having clothes that are all my own. That is why I think Customizo is VERY cool! You can customize your clothing to what YOU love to wear (not what the store sells). This is a fantastic giveaway with pinning! What fun! Do what you love and have a chance to win! 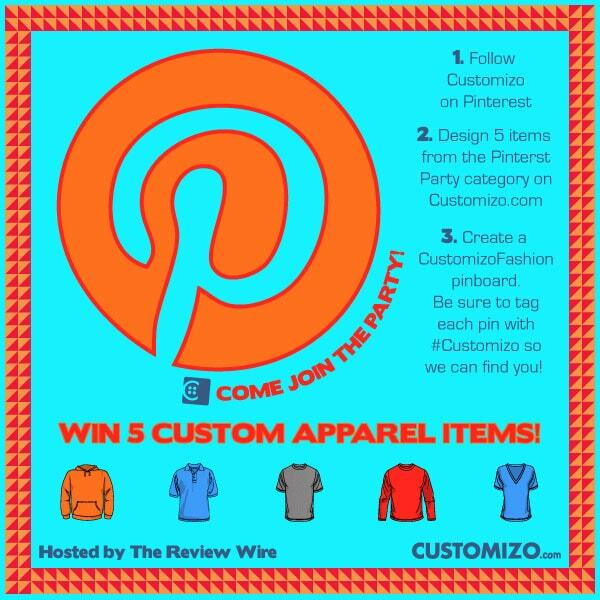 1 - Follow Customizo on Pinterest AND The Review Wire on Pinterest Create and Design 5 Items from the Pinterest Party Category on Customizo.com. Use one of the free templates or upload your own artwork to customize your items. Save your designs and grab the Share link to post to Pinterest, you will have to create an account to do this. Disclosure: This event is sponsored by Customizo and hosted by The Review Wire. MamaBreak is not responsible for prize fulfillment. Companies and bloggers, if you would like to participate in group giveaway events like this one, sign up to be emailed about future events hosted by The Review Wire.